"I looked to the right and observed that the object became bigger and the light became brighter, and I began to descend the helicopter toward the ground, to get out of the collision course path. We were descending and this object was like a missile locked onto the helicopter, only it came at us on a perpendicular angle, to hit us almost broadside. Watch this video excerpt of the Coyne account from a documentary report. The story continues after the video. With the unknown object hovering in the air above the helicopter, Coyne and his crew suddenly noticed a light coming out of the aft end of it -- a light that swung 90 degrees and came into their cabin. "It was a bright green light. And all of the red night lights that we utilize for night navigation were dissolved in this green light -- the whole cabin turned green. It hit all of us directly in the face." Coyne and his crew knew they were encountering something extraordinary. "We assumed it was a high-performance fighter, but when it stopped directly in front of us, then all four of us realized that was no high-performance aircraft. This craft, from the angle that we saw it, was cigar-shaped. It had no wings, no vertical or horizontal stabilizer, was approximately 60 feet long, 15-20 feet in height." What occurred next was like something out of science fiction. "We were at 1,700 feet," Coyne recalled. "Then this craft began to move slowly to the west away from us. At this time, I was worried we were going to hit the ground, and I looked at my altimeter and our helicopter was at 3,500 feet, climbing 1,000 feet a minute with no changes in the control. We went from 1,700 feet to 3,500 feet in a matter of seconds and never knew it!" The helicopter topped out at 3,800 feet and the four men felt a bump, "like turbulence, at which time we had control of the aircraft again. I had control and we went back down to 2,500 feet and then continued on to Cleveland," Coyne said. "As far as the vehicle itself, there's no doubt in our minds what it looked like. A craft that can move at terrific speeds in excess of 1,000 knots, and then stop on a dime, maintains altitude, can change altitude, climb, descend. To encounter a UFO when it approaches your aircraft, you have no idea what it is. I think if it wanted to collide with us, it could have. You can't get away from it -- you don't have that much time to respond!" Lending credibility to this case were eyewitnesses on the ground who observed the UFO-helicopter encounter. The Army didn't prevent Coyne and his crew from speaking out about their experience. In fact, Coyne was allowed to recount the UFO incident to the United Nations in 1978, as seen below, under the sponsorship of Grenada. This 1973 UFO incident, while certainly dramatic and terrifying for the helicopter crew involved, is not the only time that conventional aircraft have had encounters with unknown objects. Many crew members of major airlines have witnessed unusual objects near their aircraft but have been reluctant to tell their stories publicly. 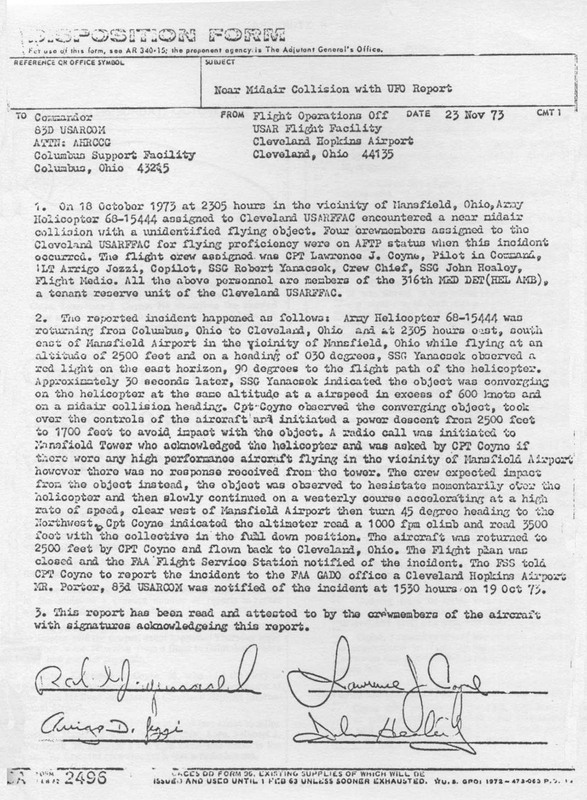 In 1999, Richard Haines, a retired senior research scientist for the NASA-Ames Research Center in California, created the National Aviation Reporting Center on Anomalous Phenomena, or NARCAP, to give pilots and air traffic controllers a confidential place to report their own unusual sightings of what Haines refers to as unidentified aerial phenomena, or UAP. "We have two objectives: To make flying safer with regard to unidentified and poorly understood phenomena in the atmosphere. And the second objective is to collect, analyze and then report high quality data from the aerospace world on the phenomena, to help us understand them better," Haines, 76, told The Huffington Post. According to Haines, on an average daily basis, since the creation of NARCAP, he's received six to 12 reports a year. He absolutely believes there are real dangerous or safety issues that come up between pilots and some UAP. "Based upon analysis of past cases, a potential for a very serious event does exist," Haines said. "We have reviewed a great many encounters in flight where several things can happen. One of them is an electromagnetic effect in close proximity to the phenomenon, where cockpit instrumentation are affected -- it might be a magnetic field, radio interference or even an inertial effect, and that's obviously unsafe. Pilots don't want to be flying airplanes where they can't trust their instruments." Another area of concern that Haines and his colleagues have found is similar to what Coyne and his helicopter crew experienced in 1973. "It's where a UAP is near the airplane, perhaps ahead of the plane, and the pilot makes a rapid emergency dive to avoid a perceived collision. That's not very common, but it would have to be reported. It has happened in the past and there are still near-misses that occur which sometimes are associated with a nearby UAP." Haines has always been impressed with the Coyne helicopter incident. "It qualifies as a genuine UAP encounter. Multiple witness cases are very important and should command the attention of aviation officials. In the Coyne case, its color, speed and apparent shape -- those are all important physical characteristics that can be related to other pilot sightings. "I think the Coyne case ranks very, very high in credibility. One reason is Coyne's reputation as a good pilot before this happened. And his courage -- the fact that he was willing to come forward with this very bizarre story and to stand by it says an awful lot. And he would give encouragement to other pilots to do the same. "If everybody remains silent, we're never going to get to the bottom of this."